Keep your media safe in a single place on this high-performance Network Attached Storage (NAS) solution, and access it securely from anywhere. With My Cloud EX2 Ultra, you'll be able to automatically sync content across computers, easily share files and folders, and enjoy multiple backup options so you can create your own personalized system with ease. With the powerful Marvell ARMADA 385 1.3GHz dual-core processor, you’ll get ultra-fast transfer rates for high performance streaming. You’ll also be treated to 1GB of DDR3 memory, so you can multitask with ease. Keep your photos, videos, music and documents safe in a single place, and with MyCloud.com or the My Cloud mobile app, you can access or share from anywhere. Automatically synchronize your media and files between your computers and your My Cloud with WD Sync. You’ll be confident your content is always up-to-date and accessible with all your devices. Share files or folders with friends and family so they can download or upload content to your My Cloud. You can also share a private link to a folder giving users read and write access for easy collaboration. With WD SmartWare Pro backup software, PC users can customize when and where their content is saved, while Mac users have full access to Apple Time Machine for personalized backup. 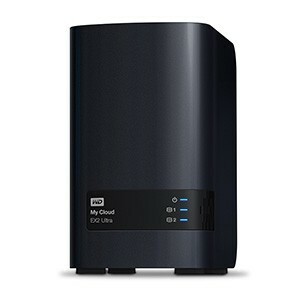 You can even automatically back up your data to a separate My Cloud NAS device, or any supported cloud service. Equipped with 256 AES volume encryption, you can securely store files across your entire network. Whether you’re using a PC or a Mac, your content is protected. With the RAID settings of the My Cloud EX2 Ultra, you can customize your system with the configuration that’s best for you. Use RAID 0 for enhanced performance, RAID 1 for mirrored data protection, or a JBOD / spanning structure for non-RAID configurations. With a tray-less bay design, installation is effortless and tool-free. Once installed, the My Cloud EX2 Ultra features an intuitive dashboard for you to create user accounts, customize features, or monitor your storage with ease. And with MyCloud.com remote access or the My Cloud mobile app, you can access your media and manage users from any device. My Cloud EX2 Ultra supports a full suite of popular applications for a personalized experience. Using apps like Plex, Milestone Arcus Surveillance, Dropbox, WordPress and more, you can customize your NAS for your own specific needs. 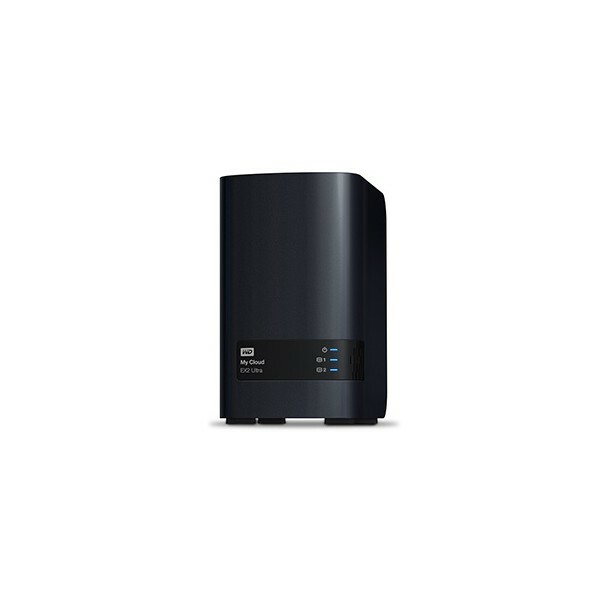 My Cloud EX2 Ultra comes pre-configured with WD Red hard drives, specifically built for NAS systems to provide improved performance within 24x7 environments. The My Cloud EX2 Ultra is also available in a diskless version, so you can create a custom NAS with compatible hard drives. WD's My Cloud OS 3 comes with a variety of tools and apps to give you complete control of the media that matters most. Create a custom folder to share your favorite content with family and friends. Automatically sync your data between all your computers, so you know your content is always up-to-date. And easily transfer content between your NAS and a supported cloud service like Dropbox, OneDrive, or Google Drive. My Cloud OS delivers tools and apps so you’re empowered to easily take control of your most important content. From device set-up to file-sharing and collaboration, My Cloud OS makes managing and using your NAS a breeze. The intuitive dashboard guides you through the process of setting up users and shares, customizing system features and monitoring your storage. Plus, mobile alerts keep you informed on the status of your My Cloud Expert Series NAS. With the My Cloud mobile app, you get the freedom to easily access and share all your favorite photos and videos using your tablet or smartphone. Combined with MyCloud.com web access, you’ll have whenever, wherever access to your content. Automatically synchronize your files between all your computers and your My Cloud Expert Series device, keeping your favorite content always up-to-date and accessible from all your devices. Create one simple place for your friends and family to collect and share all the photos and videos you create. With the extra capacity of a My Cloud Expert Series NAS, you can save all your media at full resolution, so nobody misses a thing.